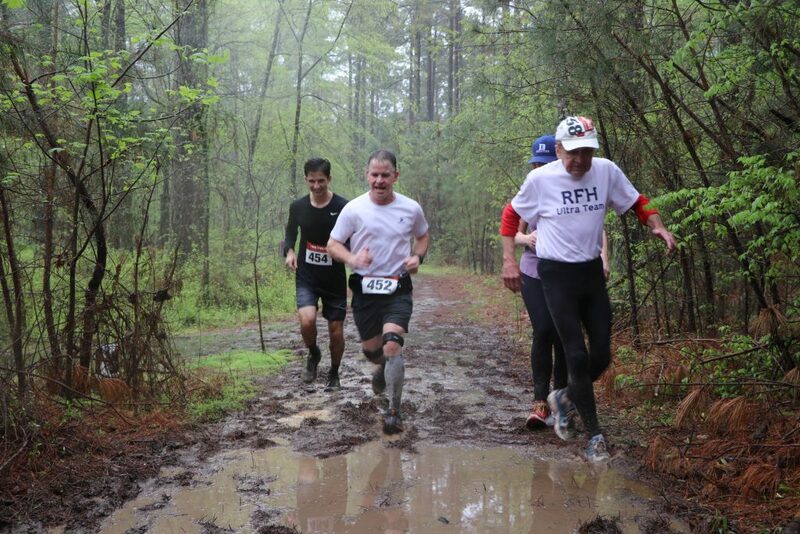 Thank you to all the runners for keeping such a great attitude in the rain and mud, to the volunteers for your awesome service, and to the Jordan Lake Educational State Forest for a beautiful venue. We had a great time! Race Day Registration: We will accept registration both this afternoon (3-5pm) and tomorrow morning (6:00-6:45am). 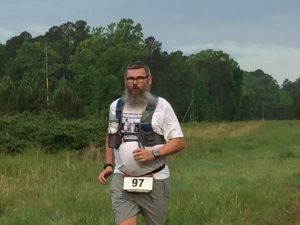 Both will be at the start/finish which is at the Picnic Shelter at Jordan Lake Educational State Forest. Bring correct change or a check. Teams $240 / Individuals $90. Course Change: Tomorrow we will be using an alternate course due to the rain and threat of storms. 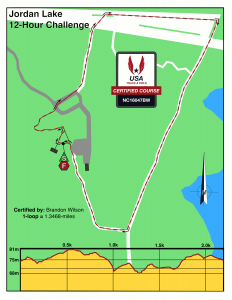 The alternate course is USATF certified and 0.967 miles in length. It’s shorter and very similar to the regular course. We think it is better to switch now to the alternate course than to risk the closing down of the race if the regular course becomes unusable after the race starts. The regular course is subject to flooding from lake levels which have been high ever since last fall’s hurricanes and an unusually wet winter, combined with this week’s rain. Secondly and more important, the regular course has a section in an open field which presents greater risk if there is lightning. 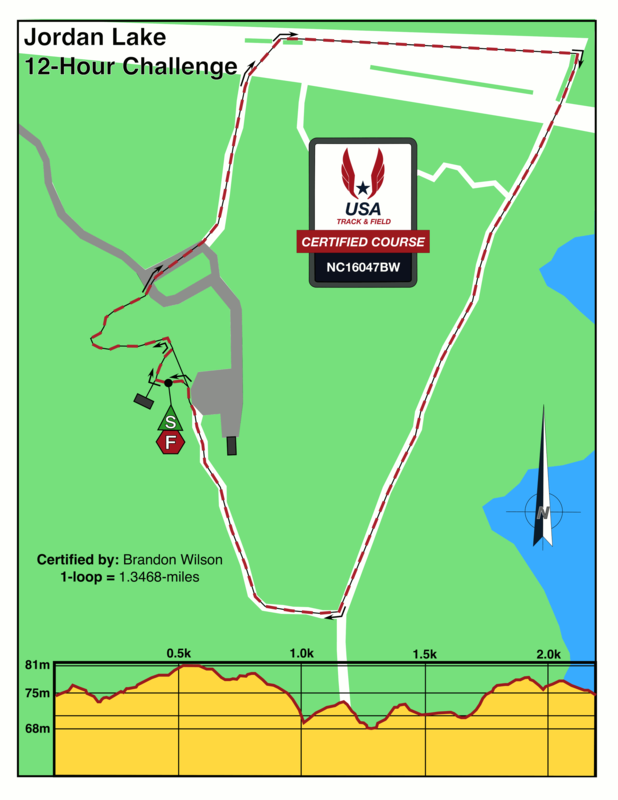 The course will be marked by 3pm today, if you would like to see it during packet pickup (3-5pm). Teams Change: Teams will use a chip bib instead of a baton. The team will use a single bib. The bib will be attached to a lightweight removable belt. You will exchange this bib instead of a baton. Live Results: Results will be live online throughout the race HERE. How much distance can you cover in 6 or 12 hours? Come and find out! With both team and individual competitions, and a choice between 6 hours and 12 hours, there is a challenge that fits almost everyone. The course is a 1.35-mile loop on old road bed and trail with glimpses of the lake. Every 1.35 miles you’ll pass the aid station with cheerful volunteers, cold drinks and more! You can even set up your own aid in the same area. 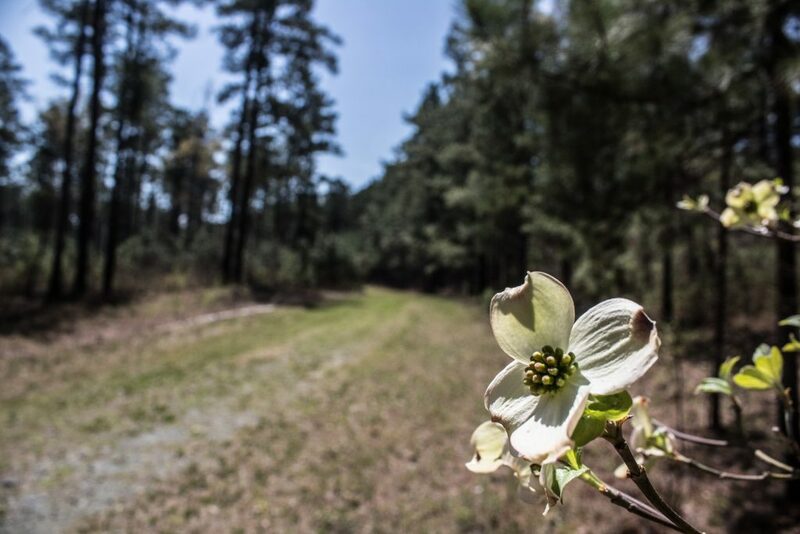 The course and headquarters are located within the NC Forest Service’s Jordan Lake Educational State Forest. The course will be the same as in 2018. It is a 1.35-mile loop on old road bed and trail and is USATF Certified. 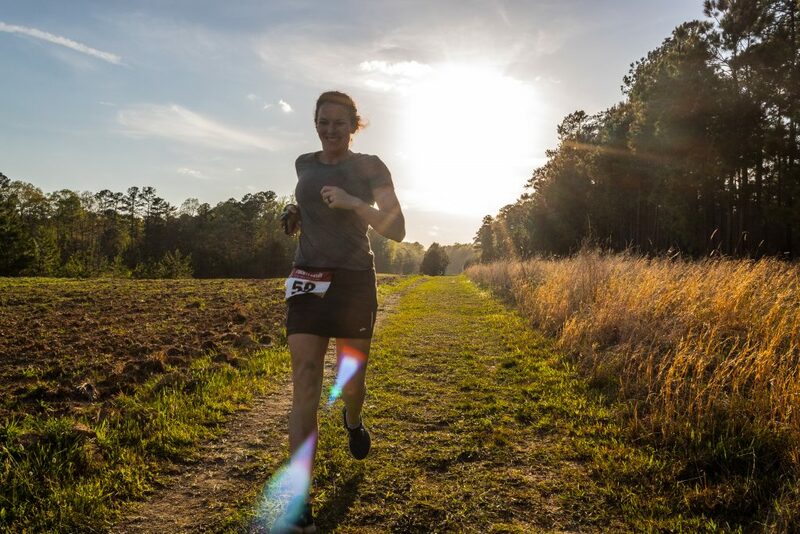 It is a flatter course than our original course which means more miles for you! If you would like to explore the course using Google Earth, we can email you the .kml file. Send your request to 12hour@chathamkids.org. You will also have to download the Google Earth Plugin if you have not already. Jordan Lake Educational State Forest is located at 2832 Big Woods Road, Chapel Hill, NC, in northeastern Chatham County, about 13 miles south of Chapel Hill or 30 miles west of Raleigh. Parking will be in front of their Stan Adams Training Facility and the Aid and Timing Stations will be located at the Picnic Shelter. 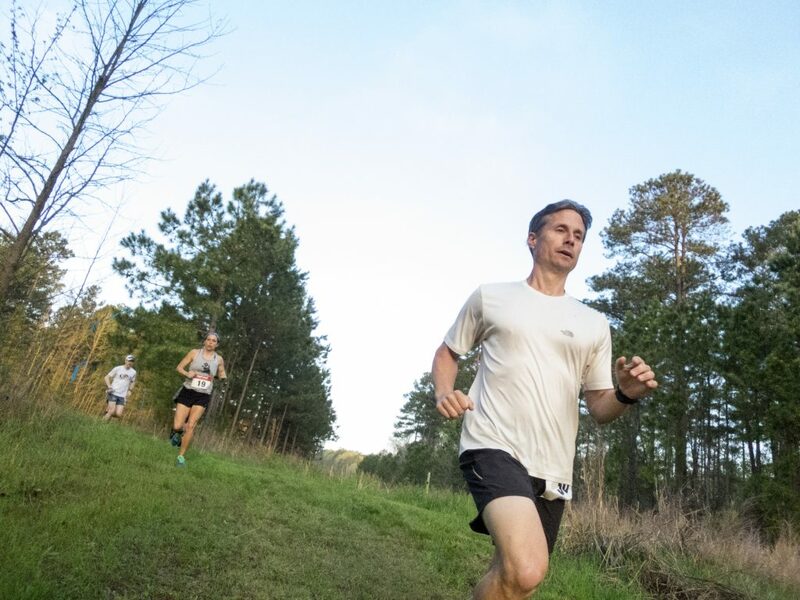 To navigate to the race venue, please use the street address or the name “Jordan Lake Educational State Forest.” Do not use the term “Jordan Lake” only, as the lake has many other recreational areas which are miles away from the race venue. The award ceremony for each event will immediately follow the end of that event (at the end of 6 and 12 hours). All registered participants will receive a sport wicking race shirt (if registered by March 28). No awards or shirts will be mailed. The aid station will be located at the Picnic Shelter. You will pass it every 1.35 miles. Our aid crew will be there for the entire 12 hours with a variety of food and drinks, cheering you on and offering any support we can. Near the Picnic Shelter there are plenty of spots where you can set up your own aid. Pizza will arrive around noon and 4:00 p.m. Restrooms and portable toilets will be available nearby. The distance after last FULL lap completed at the 6 or 12 hour mark will be the official finish distance. There will be no credit for partial laps. Relay teams consist of 3 people. Relay teams may take turns in whatever order they wish to create a total team distance. Team members must carry a lightweight baton with timing chip to facilitate accurate counting of the team distance. They may only hand off the baton at the aid station. 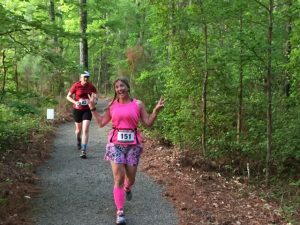 Runners may only switch between the 12-Hour and 6-Hour events using Ultrasignup.com prior to the registration deadline on April 11. No switching of events will be allowed on race day. Please notify event staff if you abandon the race prior to the finish time. All runners must wear a bib number visibly at all times. Individuals will wear a chip bib; team members will wear a non-chip bib. Please, no littering. Any food, gel packets, tissues or other items you take into the woods should come out with you. There will be trash cans provided in various locations. No alcoholic beverages are allowed at Jordan Lake Educational State Forest. The local fire department will be on site the entire 12 hours for first response. The course crosses park roads in a few places, and signs will be posted to warn drivers. Online registration will close on Thursday, April 11 at 11:59 pm, or when filled. Registration will be limited to 100 runners inclusive of relay team members. There will be no wait list. Registration fees are non-refundable, non-deferrable and non-transferrable. Jordan Lake has several great State Park campgrounds, but they all lock their gates overnight and do not open them until 8:00 am. The only way to camp there and make it to the start would be to bike out or have someone pick you up from the outside. If, however, you want a place to stay after the race, the campgrounds are a great choice. For the night before the race, look for lodging in Pittsboro, Apex or Chapel Hill. Chatham County Partnership for Children promotes opportunities for all our young children to grow up safe, healthy, and able to succeed. We are home to Smart Start, Child Care Resource & Referral, NC Pre-K, the Child and Adult Care Food Program, Dolly Parton’s Imagination Library and Raising a Reader. To learn more, explore our website. Please direct all inquiries to the race director.